A Maine brewer is offering a quicker way to consume two of the state's summertime staples: beer and lobster. Oxbow Brewing is serving up beer brewed with live Maine lobsters and a dash of sea salt. Brewmaster Tim Adams says the lobsters were placed in a mesh bag and suspended in a kettle full of boiling wort during the brewing process. He says the lobsters add a subtle brininess and sweetness that lobster fans will recognize. The beer is a saison-style beer brewed in collaboration with a brewery in Parma, Italy. It is 4.5 percent alcohol by volume and is available on a limited basis. The beer became available this summer. 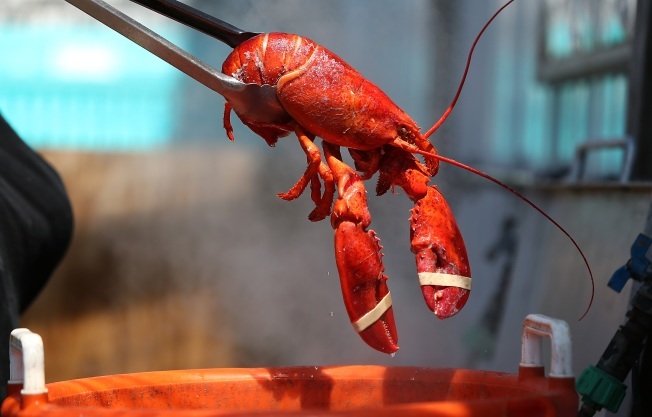 Adams says the lobsters that were cooked in the brewing process were later eaten.